There are many brands of sheet metal automation. Some are good and some not so popular. But with the plethora of options out on the market, companies in Australia and New Zealand sometimes face the choice of whether to choose just one brand or mix it up a little. Automation specialist Advanced Sheetmetal technologies (AST) represents various quality global brands and can identify key trends that have emerged overseas, which are more than likely to influence fabricators in the region, when the time comes to make this choice. There are quite a few companies in Australia and New Zealand, which have automated to greater extent and found integrating different brands of machinery to be seamless, primarily because software is so powerful and easy to use, according to AST. But there are also circumstances where, standardising on a single brand has its benefits, and there is no denying the positive outcomes. Activity in more mature markets overseas supports this argument. AST is the exclusive distributor for many brands of sheetmetal automation, but it does respect those successful companies such as Red Dot Corporation in the United States, will specify several key reasons why they want to standardise on a single one brand and build their businesses on that platform. Red Dot Corporation designs and manufactures heating and air conditioning systems for the heavy-duty vehicle industry to companies such as Kenworth, Freightliner, Mack and Peterbilt trucks. To manufacture its products for the world market, Red Dot’s Seattle location has two buildings with 250,000 square feet of capacity and 450 employees. Red Dot also recently opened a 75,000-square-foot facility in Memphis, Tennessee, with 18 employees, and a 25,000-square-foot facility. Red Dot Europe, LTD is located in the U.K. with 18 employees. Red Dot differs from a lot of companies in that it uses two or more remote buildings to manufacture its products, so from the outset had particular requirements for standardised sheetmetal automation. With various Australian fabricators now setting up in the same fashion, the positive experience by a company like Red Dot serves as an indicator of which direction to take. Red Dot Corporation chose the FINN-POWER brand several years ago, and as its business has grown, red Dot has been able to add to various technologies and seamlessly integrate these into the overall production scheduling. Apart from manufacturing across different sites, Red Dot determined that by using solely the FINN-POWER brand, it can standardise all tooling and maintenance, and also receive extensive engineering support from FINN-POWER via its regional supplier. Ultimately, Red Dot Corporation is driven by its corporate philosophy for lean manufacturing techniques to improve output and profits, and saw standardisation on FINN-POWER automation as the way forward. By standardising the Finn Power equipment, Red Dot has been able to keep many manufacturing in-house and control its own destiny in terms of quality and deliveries. Red Dot is a vertically integrated company that manufactures more components used in its products than any other HVAC supplier in the heavy-duty industry. The manufacturing processes involved in producing condensers, wire harness, tub assemblies, evaporators, heater cores and sheet metal components, requires specialised equipment. Red Dot’s fabrication equipment includes turret punch presses, lasers, press brakes, tube benders, stamping presses and spot welders. The strategy is to continually invest in equipment and have the resources available that offer flexibility to quickly and efficiently build to customer specifications. In 2004, Red Dot needed to increase its turret punch press capacity to keep pace with both double digit growth and a new government contract that put increased demand on the fabrication department. The U.S. military decision to armour plate all the Humvees used in Iraq, created a major challenge to keep the vehicle’s cab temperature cool enough for the soldiers and marines to operate effectively. With the armour plating, high temperatures were registered inside the cabs. In late 2004, Red Dot met the challenge and was awarded the contract to retrofit 20,000 of the armour-plated Humvees with upgraded air conditioner units. The project was recently completed in November, 2005. While Red Dot looked at equipment from several builders, it eventually chose the FINN-POWER C5 Compact Express. Red Dot purchased the FINN-POWER TP turret punch press 12 years ago and the F Series machine about six years later. One of the goals was to standardise equipment for benefits in service and maintenance, tooling, software, etc. In January 2006, the FINN-POWER C5 Compact Express was installed at Red Dot. The C5 Express adds unmanned operation to the C5 turret punch press through highly compact load/unload automation. The unit’s loading/unloading solution utilises the space above and below the machine, requiring only slightly more space than a turret punch press. The small footprint of the C5 Compact Express makes it easier for one operator to run two machines. 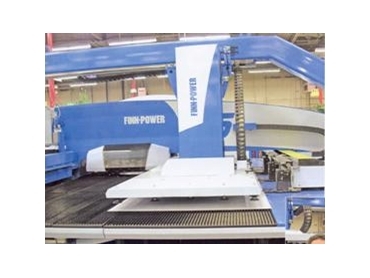 The 20-station, 33-ton C5 hydraulic turret punch press has a maximum sheet capacity of 1250mm x 2500mm, and is available with either Siemens or Fanuc controls. Tooling flexibility is also important to Red Dot. Up to 10 auto-index and Multi-Tool holders may be installed in a FINN-POWER turret. Red Dot has four Multi-Tool cassettes in the C5, a 24-station, two 10-stations and an 8-station. Red Dot also has six full tonnage auto-index stations and two indexable upforming stations. Unique to the C5 turret punch press, full tonnage indexable upforming allows complex forming operations to be made quickly by using a single forming tool. An index mechanism is used to turn the forming tool into an NC programmed angle. FINN-POWER’s upforming feature provides a precise process for knock-outs, louvers, and other forming. FINN-POWER resolved the conventional problem of the die height impeding free sheet movement. The unit’s design allows forming heights up to 16 mm, with the forms made by the die moving upwards and then retracting, allowing completely free sheet movement, eliminating scratched or jammed sheets. Red Dot uses dimples on its parts for locating in spot welding. It is important for the operator to have dimples that can go up or down, sometimes both on the same part. Red Dot also uses louvres and flanges on its parts. Super fast servo hydraulic punching, nibbling speeds of up to 1100 hpm. The servo-controlled ram, stroke speed, and position are fully and individually adjustable in both directions. Another benefit is different punching modes (punch, Quiet Punch, down-forming and marking). Easy loading - Four optimally-positioned gauge pins allow easy loading of blanks or full-sized sheets. Sheet loading is performed with a simple push and always close to the table edge. Sheet supports rise from the table to allow easy positioning of heavy material. Efficient unloading – The C5 delivers the processed components to a freely programmable position on the table, increasing the operator’s efficiency. The entire material flow on the C5 can be conducted from just one side. This allows simple and efficient logistics, and enables the machine to be positioned anywhere on the shop floor, even in a corner. Automatic clamp setting and movement – FINN-POWER’s patented automatic clamp setting PCS is a standard C5 feature. The clamp setting PCS automatically positions sheet clamps according to the numerical program, virtually eliminating punching of the clamps. When changing production from full size to small sheets, clamp settings can be made automatically without wasting operator time. Catch & Carry work chute – FINN-POWER’s Catch & Carry work chute is not just a drop door or a work chute in the ordinary sense. The work chute’s mechanism allows the reception of several components to 500mm x 500mm in size onto a level from which, they subsequently exit from the machine as a stack. For Red Dot, the FINN-POWER turret punch presses make many of the sheet metal parts for its HVAC units. Management believes that it could not have completed the military project in-house, without the addition of the C5 Compact Express. In addition, during C5 installation and training, the FINN-POWER technicians gave Red Dot engineers ideas on how to design products to use the features and capabilities of the FINN-POWER turret punch press.